One man who is often overlooked in our sport is its first post-war superstar and the first man to win eight world or Olympic gold medals who worked as a humble guard at New York’s Riker’s Island Prison for many years. This man was John Henry Davis, named after the legendary Black steel driver. Born on January 12, 1921 in Brooklyn, New York, he would grow up a worthy facsimile of his namesake. He did this in the fore and after shadow of World War II, of which he was an army veteran. That war interrupted his and all of weightlifting’s progress for many years. And it is because of this time frame that Davis’s legacy is the subject of some controversy in regard to just how he would compare to other greats, particularly those others that have also won multiple titles in subsequent years. This is often debated since while he competed mostly in the heavyweight category (over 82.5 kg in most of his career) while standing only 5’8’’ and weighing from 90 to 107 kg, since this is significantly shorter and lighter than the men who would succeed him. While his lifts do not look so impressive compared to modern performances many might dismiss him as just an old-timer who was lucky to compete when he did. But is this fair to the man? Art Drechsler of New York wrote a paper entitled “How Good Was John Davis?” some time ago where he sang the praises of the man. I myself remember when he died (from cancer on July 13, 1984) just a few days before the start of the LA Olympics. I was the Canadian team leader then and remember the discussion among the people there who remembered him, among them Morris Weissbrot, Tommy Kono, John Terpak and Rudy Sablo. In this paper I will attempt to illuminate the debate so that readers may come to their own conclusions just as I came to mine. It is only on this final point that I disagree. Davis was undefeated for a fifteen-year period, encompassing the war years, so it is logical that he would have won the 5 world and 2 Olympic championships not held, giving him 4 Olympic and 11 world championships, had it not been for the war - a tally unapproached in the intervening fifty years, making a very strong case that John Davis was the greatest weightlifter of all time. Wilhelm (1996, p. 5) notes that “In 1992. [Kono} was acclaimed by...[International Weightlifting Federation] vote to be the greatest weightlifter of all time”. Kono’s obvious achievements notwithstanding, the selection of anyone other than John Davis for that honour demonstrates that he remains underrated and one has to wonder to what extent that is race-based. Perhaps the greatest measure of his ability is that recognizing Davis as an eight-time world and Olympic champion does not give him sufficient credit for longevity. Before we get too far I must question the idea that the choice of Kono over Davis as the greatest of all time as being “race-based”. That may be true with some but I don’t think that it would be accurate for a majority of the judges. For starters, Davis was very popular with most who knew him in his prime. He had few serious detractors. Most of the judges were born later and never know him, especially since most probably were from Europe and so may not be quite so informed by anti-black sentiment in the first place. And this supposition also does not take into account the qualities of the other candidates. There is little to choose from when you mention names like Davis, Kono, Alexeev, Suliemanuglu, Rigert and others. No slouches, any of them. You could name anyone of them as the “greatest” and still have much to support your choice. So I don’t think racism can be considered the obvious reason Davis was not chosen. A possible one but not an obvious one. In comparing him to the other three multiple winners mentioned above it is interesting to note that all four were members of ethnic minorities in their own countries. Davis was an African American, Kono was Japanese in post war Hawaii, and Sulemanuglou was a Turk, an historically unpopular people in Bulgaria. Since most weightlifting writers who are in a position to grant immortality to such athletes are Caucasian some would wonder why one might suspect racial bias when many of the candidates might be beyond the pale to potential bigots in their midst. Bob Hoffman certainly had his share of human failings. His detractors have been as eager to point these out as he was to detail his ever peerless bent pressing, canoeing and polka dancing abilities. But ethnic or racial animosity was not one of these failings. Even if he had held prejudiced views privately (no such evidence) as a good businessman he at least never let anything like that prevent him from fielding his best team possible, as Fair pointed this out very well in “Muscletown, USA”. In an article in the September, 1966 S&H Hoffman remarked that he and Davis were indeed refused service in many restaurants in those pre-civil rights days. It may be interesting to note that the possible snubbing of Davis was not limited to those pundits of more Nordic origins. Even “Ebony” magazine, a sort of competitor to “LIFE” in the African-American community, was unaware of his accomplishments. They did a feature on Black Olympians just prior to the 1996 Games in Atlanta. All of the storied names like Jesse Owens, Rafer Johnson, Wilma Rudolph and Cassius Clay were duly noted. But they missed Davis, who won not one but two gold medals. That can be blamed on our sport’s low profile I suppose. Moving to the issue of consecutive victories I believe that Suliemanuglu’s performance in my opinion should not be denigrated because his victories were not consecutive. The only reason they were not was due to the years he had to sit out due to his defection and citizenship change. His victories, although made decades after Davis’s, were made when competition was much tougher and deeper. It should be remembered that he was never defeated in his years at the top. The only mark against him was his ill-fated comeback in the 2000 Olympics. As for imagining how many Davis, or anyone else of that era, might have won if not for the obnoxious personality traits of Herr Scheikelgruber, that is not as obvious as Kodya assumes. All other things would probably NOT have remained equal if only the war hadn’t occurred. History would have probably been much different, even in weightlifting. If the war hadn’t intervened, would Davis have stayed in the game until 1956? Maybe he would have and won more titles or maybe he would have tired of the game in the mid 1940s (all of this assuming no injuries). Who is to say that other stars might have emerged as the sport developed without the inconveniences caused by a long war? What if no one had to take that early 1940s layoff? The war slowed down progress not only for those years but for five to ten years after. The results show this clearly. After one or two leaders they drop off dramatically. Davis, from North American did not have to cope with the disadvantages that most Europeans faced. Dennis Hillman has told me many times of how Britain retained food rationing until the mid-1950s. It was worse in Eastern Europe. What would have happened at the Worlds if healthy countries could have prepared for them? The US can credit much of their post-war dominance of the sport to this situation. They had no food shortages or bad economy to stifle their efforts, but much of the rest of the world did. Apart from Doug Hepburn, Dave Baillie and Gerry Gratton we in Canada did not have enough lifters or infrastructure to take advantage of a similar situation. That said I agree with Kodya that Davis is certainly under-rated by many of those discussing our sport today. But was it always so? If he is underrated what is the reason? While John Davis undoubtedly suffered many indignities over his lifetime, I believe the reason for Davis’ omission from the pinnacle of weightlifting fame has more mundane origins. I think a bigger roadblock to Davis’s place in history is, well, his place in history. He started his career in the mid 1930s and was finished in 1956. Time has since decimated the ranks of those who might have seen him in the flesh. Anyone who saw him lift would now be about 75 years old at the earliest. 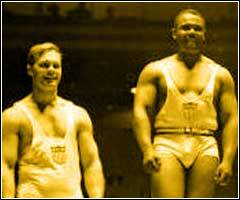 In his day only Strength and Health (USA) and Health and Strength (GBR) were available to herald his exploits. The Weider mags were available but were not usually in the habit of praising York men. By contrast, Tommy Kono came along just when Davis was fading and lasted until 1965, so there are somewhat more of those who remember him. But more important I believe is the fact that Kono has maintained some profile in the sport all through these last 40 plus years of his retirement from active lifting. He has coached in Mexico, Germany and the USA, written a book (The ABCs of Weightlifting), coached in the Honolulu YMCA and has been an active international referee all those years. Davis however, walked away from the sport and had little contact with it save for the odd honours and testimonials and such. This will make a difference when it comes to making a mark in the sport’s collective memory. We will compare Davis to Tommy Kono since he was closest in time line and lifted under more similar conditions. Here are Davis’s World and Olympic performances with the also-rans averaged to show how far they were behind Davis. We see some big leads over the second place winners and another big jump over those in third. This reflects the low turnouts and the still undeveloped state of the lifting world in the 1940s. His stats are considerably improved with the 1938 results when competition was keener and there are always more competitors at that weight. Despite this situation John Davis was still the top star of the late 1940s. Even with ineffective competition he lifted in proportion to the other categories. When this is done that means that the athlete is not lazy or taking the easy way out. But rating him on an all-time list is more difficult. In his later career he probably had more trouble winning the US nationals over Ski and Bradford than he did with the Russians and others at the Worlds. We can see that Kono had somewhat more dangerous competition all through his career. The average percentages of Kono’s totals that his opponents achieved were somewhat better than Davis’. He was never too far ahead of his silver medal winner. The drop off to bronze was more but as mentioned the overall competition level was still rising out of the post-war doldrums. This amounted to closer matches. It is always problematical to compare athletes of different eras. If one easily defeats all opposition is he a far superior athlete or is the opposition so bad that his victories are insignificant? Similarly, if he beats everyone by only a small margin was he a champion who was always able to prevail over tremendous competition or did he do little more than rise above mediocrity himself? This situation can be seen in many sports and is very difficult to argue when performances cannot easily be quantified. Were the Edmonton Oilers better than the five-in-a-row Montreal Canadiens since they had to struggle beat other teams to win their Stanley Cups? Or were the Habs better because they steamrollered all others? But maybe those others were horrible, and maybe they weren’t. Our sport does have the advantages of having solid numbers but even they cannot be compared easily across eras. The only way to compare lifters is to compare then to others in different categories during their era. Here is where John Davis shines. Although his opposition is somewhat weaker than Kono’s, his best lifts are about where they should be compared to those in lower categories if one does not include the early 90 kg athletes, Schemansky excepted. In the years 1948, 1949, and 1951 Davis’ totals dropped off due to weaker opposition but as Hoffman said, he never lifted as much as he had to, only as much as he needed to. This strategy can be criticized as being sub-competitive in that if it continues over many years the athlete cannot be turn on the afterburners any more. That is what happened to Zhabo. But this strategy also leads to fewer injuries and longer careers. John Davis seemed to make it work. Another factor leading to Davis’ being under-rated was his size. He was finally defeated by a much larger Doug Hepburn, who was in turn succeeded by Paul Anderson, Yuri Vlasov, Zhabo and other much larger men. It only seems reasonable that Davis could not match these men, even with some sort of time adjusted performances. So they forget about Davis. In this there is some truth. Indeed, trying to compare Davis to these later heavyweights I believe this is a mistake. They all had too much for Davis, who never topped a somewhat soft 107 kilos or so. Therefore, if we want to compare him to more modern lifters I think we should give him the “fantasy” opportunity to do so as a competitor in what would have been his more natural weight categories. As we know these did not exist in his day so he had to lift against larger men who he was still able to beat. It is far more instructive to compare him to other similarly sized men in the 94-100 kg categories, men like Dr, Vorobiev, Louis Martin and David Rigert. To do this we should take his performances and adjust them for three things: bodyweight, technique improvements, and total inflation. Let’s start by taking his 400 pound C&J made in 1951 at a bodyweight of about 100 kg, give or take. As my friend Art Drechsler points out, Davis had to lift with some handicaps compared to those that came later. Let’s show him the modern pulling style (ironically pioneered by Kono), letting him brush his thighs and even get a hip kick out of it. What would that add? Maybe another 20 pounds or so. Then we teach him to squat clean. That would add another 20 or so for sure. Let’s then inflate this some more to take into account the natural competitive progression of the sport over the half century since he has been gone (we must not get too excited here, since some of that increase has come from the factors already mentioned). Davis would have accepted and met that challenge and the increase would be still be significant. That might make his 1951 lift of 400 pounds more like 470-480 or so, being conservative I think. Now that is still a ways away from what was being lifted in modern times, somewhere in the 530 rage foe 100 kg athletes. But of course we would still have to make one more adjustment. And we all know what that is. So I think we can say that Davis could lift with the 94-100 kg men of today if he had arrived 50 years later. Even at that, he would still not embarrass himself against the supers if he did have to lift against them. To view video clips featuring John DAVIS please follow the link(s) associated with clip images above.